There is not much to say about this clean boost pedal. 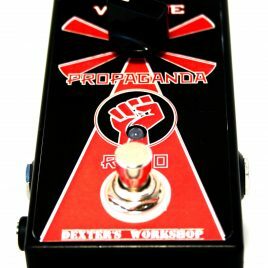 The “Propaganda Radio” will open a new dimension on how your guitar will sound in front of an amp. It will add that perfect balance of boost and attack and will leave your tone unmodified and unaltered. What can you want more? 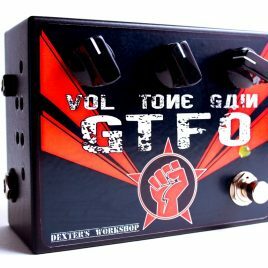 This pedal will make your amp scream and will unleash your creativity by taking you tone to a whole new level. Each unit is hand built and is using only top notch quality parts. Keep also in mind that each unit is individually inspected and tested, those features mixed with a two year full warranty* will give you a tool that will not be able to take out of your pedal board. The unit is compatible with all center negative (negative tip) pedal board supplied and can accept DC voltage (with correct polarity – negative tip) between 9 and 12V. NOTE! *Parts/events that are not covered by warranty: reverse polarity or wrong power supply used with the unit, liquid spills on the unit, mechanical destruction of the unit (warranty will not cover chips and dents in the paint finish). THE GTFO is the result of almost 4 years of experiments,testing and design. This high-gain overdrive was build to deliver the most authentic tube sound that a pedal can deliver. The pedal is build using 2 x 12AX7 (ECC83) (NO solid-state elements in the audio path) tubes that are supplied with high voltage (300V) so, this is not a starved plate design and the tone that can deliver is a proof of this. Inside, a DC-DC converter is used to boost the 12V DC supply voltage to 300V DC. The pedal is delivered with JJ or TAD tubes and also with 12V @ 1.2A wall-wart so you can use it immediately in your pedal-board. Another important feature is the small footprint (11 cm x 9.5 cm) so you can fit it in almost any pedal-board. No simulations, no fakes, no compromises ... just pure guitar TONE. 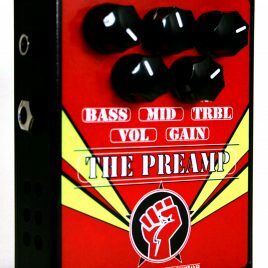 A small classic tube preamp based on a very famous bass preamp (preamp that was inspired by the Fender Dual Showman), with some added features: – separate gain and volume controls will enable you to enter in the overdrive domain, so you can keep a decent output volume and get that pumped tone. – high-voltage FET buffer (optional) The preamp uses an internal SMPS module for the High-Voltage and will need a 12V DC @ 1A wall-wart (provided with the preamp). The version of the current preamp wi MK1-V2 and comes with the following updated features: - Input pad (-6db) - Deep switch - Bright switch - High-cut switch - Output pad 1:10 attenuation Please note that the color for the new versions is red. Due to high volume of orders delivery time is between 14 to 20 working days from the order date. Thank you for your understanding.